Seeing the Zapp Flex from the front, it looks like a futuristic space capsule stroller of some sort; it is modern looking with a sleek and eye-catching design in a variety of stylish, bright colors. While it is a lightweight stroller with umbrella handles, it folds out to full size, making the Zapp somewhere in between a full size stroller and an umbrella stroller. 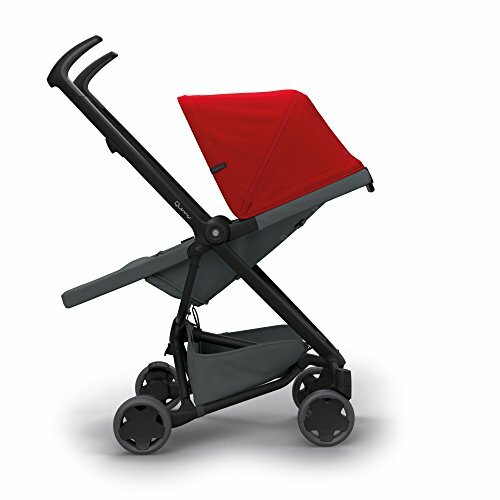 Quinny is a European brand now available in the United States and demand for this stroller has gone up since it was first introduced into the market. The Quinny Zapp Flex, which was once available only in Europe, is now firmly established in the USA. Let’s take a look in detail at what the Quinny Zapp Flex has to offer, and keep reading to find out what all these new improved features are and how they can benefit you and your child. 1 Can I use this stroller with a newborn? 4 What kind of storage and amenities does it have? 5 What about the sun canopy? 9 Where can I buy this awesome stroller? 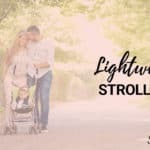 Can I use this stroller with a newborn? Now the Zapp is not for use with babies under 6 months old because, while the seat does recline, it is a molded seat and is not flat. But you’re not out of luck if you have a small infant. For babies younger than six months old, you will have to invest in the Maxi Cosi car seat until your baby can sit up unassisted. The Mico Infant Car Seat is the one to you want to get for your Quinny Zapp Flex. All those different colors look utterly fantastic or you could just stick with a basic black car seat for a sophisticated light weight travel system. The Zapp Flex includes the car seat adapters, no need to purchase them separately. And here’s a fact for you: the Maxi Cosi Mico is rated #2 in Consumer Reports for 22 lb. capacity infant seats. It earned an excellent mark for crash protection, very good for easy of use and fit to your vehicle using the LATCH system. I like knowing this! Another stylish option is to use the Lux Tukk carry cot that also sits right on top of the frame and has a sleek design. The Quinny Zapp Flex has a full-size reversible padded seat for your youngster with an adjustable 5-point safety harness and a buckle that keeps your passenger snug. Machine-washable fabric is a highlighted new feature on this updated model. When the seat is forward facing; there are three positions which are upright, fully reclined and half reclined. 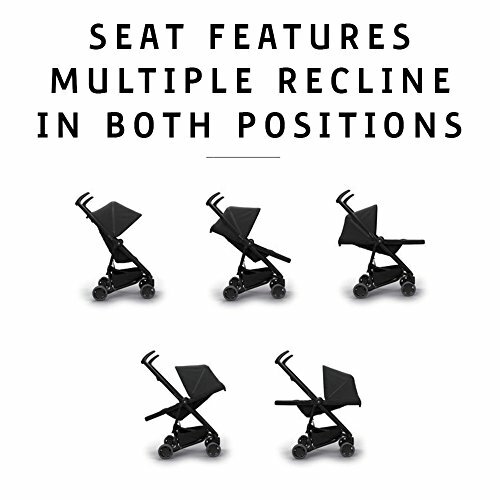 When baby is parent-facing, the recline is either full or half way; it does not sit straight up in the reverse position. The one-handed button on the back makes it easy as pie to change positions and, like other luxury models such as the Buzz, the seat is one molded piece so the entire seat reclines, not just the back. An updated leg rest gives your child a supported recline when it’s naptime. Are you planning a trip or enjoy traveling with your family? Then you’re going to love the light weight and compact fold of this product. This stroller’s most famous feature is its ultra-compact 3D fold which goes down to a 27″ x 10″ x 11″ size. That’s small enough to stow in the overhead bins on an airplane! While the compact size of the Zapp Flex is quite nice, it folds in three steps and takes two hands. Don’t let that put you off, though, because with just a few practice rounds, you can get the hang if it with no problem. The space you’re going to save with the ultra-compact fold is worth your while to put baby in the car first or have somebody hold your little one while you fold it down. Each of the wheels pop off with the push of a button making it even more compact, if needed. This official Quinny video demo shows you the fold sequence. What kind of storage and amenities does it have? While the Quinny Zapp unfolds to a full stroller size, it does have fewer amenities. You’re not going to get a cup holder or child snack tray , but you will get an underseat basket which is a bit small; you won’t be able to fit a large diaper bag in it, but you can bring along baby’s essentials. What about the sun canopy? The sun canopy is made of poly-nylon and has a zip-out panel to allow for full coverage. The only thing it is missing is the peek-a-boo window. I’d love for it to have a mesh panel with magnetic closure. 360 degree lockable front swivel wheels maneuver beautifully. The maneuvering and steering is one of the most popular features on the Zapp in all its former and current variations. Made of solid rubber, the wheels are 6 inches and can roll easily on smooth surfaces. Because of the wide wheel base and the light aluminum frame, a one-fingered push is all you need to turn this high quality product on a dime. Locking the front wheels provides additional stability. The brakes are rather unique in that you engage them with one touch on the right and disengage with one touch on the left. At the time of writing, the Quinny Zapp Flex has been getting high ratings mostly for the maneuverability and compact fold. Customer reviews are remarking how much they love this stroller for its futuristic looking style. 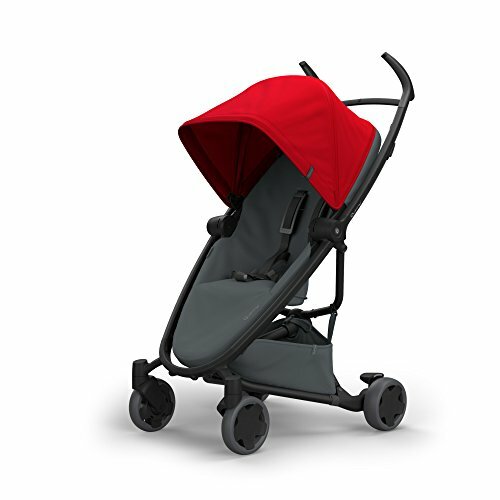 Moms say they love the look and feel of the stroller, and that they love how well the canopy protects from wind and rain. 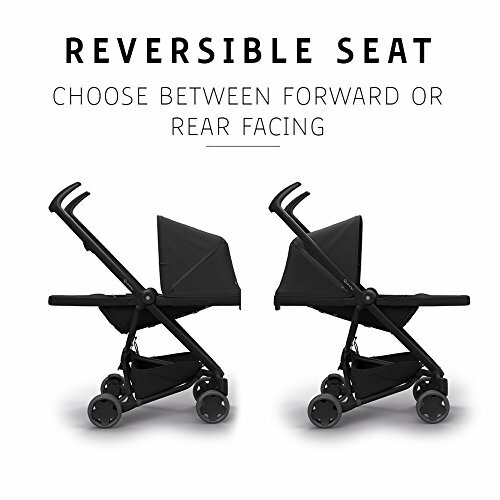 Many customers have remarked at how easy this stroller is to assemble after delivery. You only have to attach the wheels and put on the seat, and that’s it! One of the most raved-about features is the turn-on-a-dime maneuverability; quite a few reviews talk about the superb handling. Turning in tight spaces is a specialty. Consumer Reports gave the Zapp very good marks for safety and maneuverability. Ease of use got a good mark, which is probably due to a couple of the disadvantages mentioned in the next section. HOWEVER, this is for the former model, the Zapp Xtra. The Zapp Flex has not yet been reviewed by CR. While parents adore the compact fold, many don’t like that it takes three steps to do so. They say it’s overly complicated and takes a few tries to learn how to do it. And a few mention that the storage basket is too small. Parents have complained about a lack of amenities like no cup holder, no snack tray for baby or storage tray for parents. You can buy a cup holder to add to your Zapp – which will only hold a narrow drink bottle – but there’s not much you can do about the snack or storage trays. Where can I buy this awesome stroller? The Quinny Zapp Flex is selling at full retail price at the moment. Amazon is now offering all the colors at competitive prices – it is the best place to find an incredible deal. 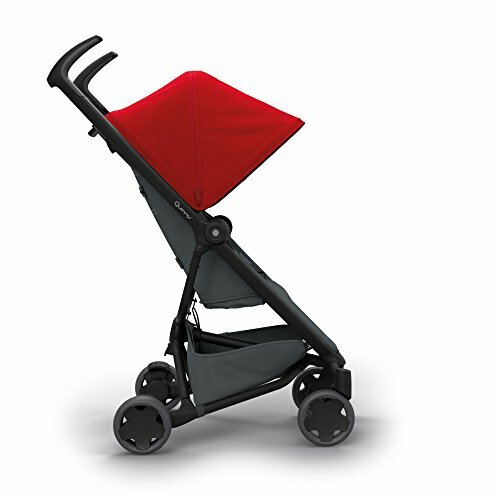 If you don’t mind an older model and want a great deal, get the Quinny Zapp Xtra with Folding Seat. Just imagine days from now using your new Quinny Zapp Flex in your favorite color!